Let's "Rock" with a Huge Log Home Discount! Home→Log Homes→Let’s “Rock” with a Huge Log Home Discount! Let’s “Rock” with a Huge Log Home Discount! If you have always wanted to own a log home and are now downsizing, or if you would like a weekend getaway log home, now is the time to contact us and save thousands! For the month of November, we are offering an Eagle Rock model One-Stop Package at a $10,670 discount. Yes, you read that correctly! 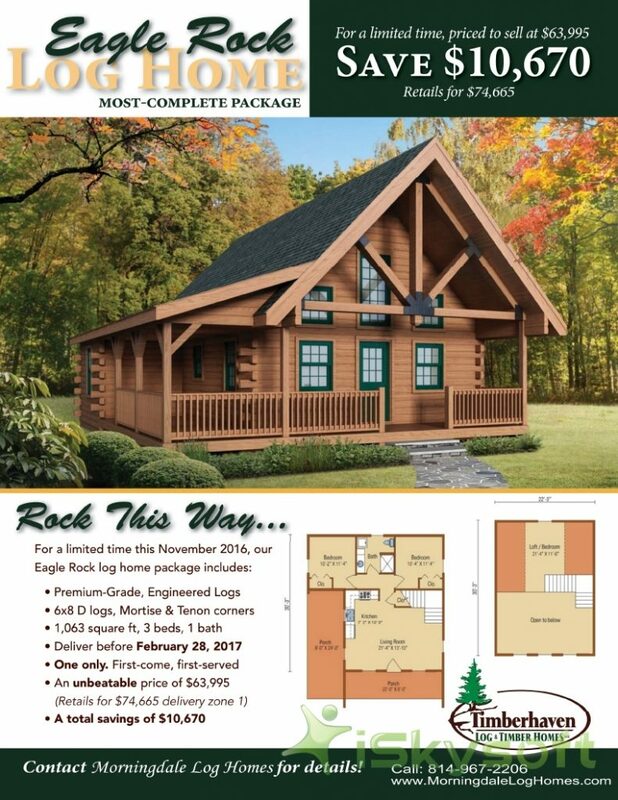 The Eagle Rock is a 1063 sqft, 2-3 bedroom, 1-bath home with a kitchen and Living Room area and is ideal for a retired couple, weekend getaway, hunting camp or home for a small family. With its covered porches and inviting front entry, the Eagle Rock makes an impression on anyone who sees it. In fact, Morningdale Log Homes already has an Eagle Rock that is under construction and almost completed as we write this post! Details of this offer are shown in the flyer below, but you better hurry as this offer will not be available for long. So, if you have a log home dream, call us and we can help make it your dream log home.